Translation from Sociologias, Porto Alegre, v. 12, n. 24, Aug. 2010. This paper introduces a debate on the main paradigms that usually base the studies concerning proposals for expanding the channels for citizen participation in public policies administration - analyses which examine participatory processes either from the perspective of "neo-corporatist" arrangements or from the view of "deliberative democracy". To this purpose, the article focus on the trajectory of the two main participatory spheres developed in Brazil over the last decades: participatory budgeting and the public policy councils. These participatory bodies were assessed especially through the analysis of four elements: a) institutional relations with governments; b) participants profile; c) scope of decision-making; and d) working dynamics. Based on the analysis of these characteristics, the authors discuss on the capability of two paradigms, neo-corporatism and deliberation, to provide a consistent model for the analysis of dissimilar participatory structures. Keywords: Public Policy Councils. Deliberative democracies. Participatory budgeting. Neo-corporatism. Este artigo propõe o debate a respeito dos principais paradigmas a partir dos quais, usualmente, vêm sendo estudadas as propostas de ampliação dos canais de participação dos cidadãos na gestão das políticas públicas, análises que investigam os processos participativos ou desde o prisma dos "arranjos neocorporativos", ou por meio de uma perspectiva baseada na concepção de "democracia deliberativa". Visando este objetivo, o presente texto centra seus interesses na trajetória de duas das principais instâncias participativas que, nas últimas décadas, foram desenvolvidas no Brasil: os orçamentos participativos e os conselhos de políticas públicas. Estas instâncias foram avaliadas levando em consideração, especialmente, quatro elementos a) relações institucionais com os governos; b) perfil dos participantes; c) âmbito decisório e, d) dinâmicas de funcionamento. A partir do estudo destas características, os autores discutem sobre a capacidade dos paradigmas neocorporativo e deliberativo constituírem um modelo analítico consistente para a investigação de estruturas participativas dessemelhantes. Palavras-chave: Conselhos de Políticas Públicas. Democracias deliberativas. Orçamentos Participativos. Neocorporativismo. This paper discusses the main participatory institutions for public administration created in Brazil as of the late 1980's, by examining the distinct analytical models presented in the literature on this subject. It is aimed to identify the contribution offered by these models to explain the institutional role that participatory budgeting and public policy councils play in the context of city and state governments in the country. It seeks, moreover, to discuss the general characteristics of such forums, so that to contribute to building middle range theories that allow locating them within the institutional and political contexts of the country and, thus, surpassing the so frequent use of case studies for analyzing participatory experiences. The literature here examined takes those forums as mechanisms for improving democracy in public administration, and is aimed not only to empirically analyze them, but also to seek a broad understanding on their institutional role. As shown by Côrtes (2005), the analysis of participatory institutions can be divided into two major categories. The first one comprises the works that show skepticism regarding the capability of participatory forums to favor a more democratic public administration. The second is formed by researchers who believe in the potential of participatory mechanisms to foster state democratization. In the present work, the analysis of both participatory budgeting and public policy councils is conducted in the light of the latter interpretive current, the one that is optimistic regarding the creation of participatory mechanisms, once they would comprise relevant channels for improving democratic governance at the distinct levels of public administration. Although sharing a positive view of the democratizing effects of participatory experiences, the distinct interpretations, here examined, on the institutional role of these forums differ on the nature of such spheres and of the social interests represented within them. For some, participatory forums comprise a public arena that enables general interests to be expressed through social movements and civil society organizations. Conversely, for others, participatory forums would be neo-corporatist arrangements for representing particular interests, which incorporate demands through the mobilization of interest groups, i.e. organizations focused on private, specific claims and not on general demands as the former ones. Both perspectives consider that participation has positive impact on the democratization of public administration. This paper, however, claims that such perspectives bring distinct contributions to the experiences of participatory budgeting and of public policy councils, since these forums comprise quite different characteristics. Therefore, an interpretation on the institutional role of forums may be appropriate for one kind of experience and not for the other. In order to demonstrate it, the following characteristics of the two forums are examined: a) institutional relations with governments; b) profile of the participants; c) issues involved in decision making; and d) working dynamics. The article begins with a brief presentation of the two contrasting views on the institutional role of participatory forums - seen either as deliberative arenas where common interests are represented or as neo-corporatist arrangements. It then presents the outstanding characteristics of the participatory budgeting forums and of the councils of social policies, seeking to check their adequacy to the interpretation models previously described. With this work, we aim to contribute to the advancement in the analysis of new experiences in managing public policies in Brazil, through the elaboration of appropriate models for interpreting the varied participatory practices that have been created in the last decades. In current debate about public policies making and implementation, several theoretical currents rival the construction of a hegemonic interpretive model able to translate most recent changes produced within state structures (Faria, 2003; Muller & Surel, 2002; Souza, 2006). In what respects to experiences of social participation in public administration, authors inspired by two distinct ways for analysis of political participation - the deliberative and the neo-corporatist - have sought to understand the institutional role of participatory forums created, since the late 1980s, markedly in Brazil. The most influent analytical approach to Brazilian participatory processes throughout the 1990s is inspired by theories which have their focus on the concept of deliberative democracy, a precious term not only to analysts as also to the advocates of such experiences. The foundation for the debate on the deliberationist approach is Habermas' work and his defense of the public sphere as an arena of discussions and negotiation involving the State and the civil society. Public sphere is neither an institution nor an organization; it is rather a communicational network - Habermas even refers to it as a communicational structure - in which the social action is produced through dialogue (Habermas, 1997). The idea of deliberative democracy, in connection with the previous concept, is based on the assumption that the process of public deliberation is central to democracy. In this conception, the democratic opinion formation, enabled by communicative processes, would represent the best way to influence the discursive rationalization of decision making by a government (Habermas, 1997). Furthering his project of renewing the theory of democracy, Habermas suggests that the concept of deliberative democracy is developed by overriding the republican and liberal perspectives of analysis. To clarify such characterization, this author emphasizes that his conception of democracy ascribes a stronger emphasis to the democratic process than that put by the liberal approach, though it is not so radical as in the republican view. Therefore, the renowned German theorist strives to rescue some tenets of liberal and republican theories in order to improve his conception of democratic political system. From the liberal perspective, maybe one of the most important issues of the Habermasian rescue is the need to establish limits in the articulation between State and Society, i.e., to prevent any prospect of insurrection from the processes of public debate in order to guarantee legitimacy to elected political representatives. In turn, from the republican approach, what comes up is the possibility of constituting a public sphere that allows interconnecting, within a same political arena, representatives of civil society and of political society, thus expanding a model of governmental administration that is based, almost exclusively, on parliamentary representation. Based on this complex articulation, Habermas produces his discursive political theory aiming a distinct object, the development of autonomous public spheres of civil society where communicative rationality can be enhanced, thus strengthening solidarity as an alternative for social integration and regulation (Habermas, 1995). As other theorists approached the debate on deliberative democracy, the conceptions elaborated by Habermas underwent a process of criticism and, sometimes, were radicalized. For summarizing the unfinished dispute, it is possible to claim that the center of divergence would lay exactly on the characterization of the dimensions of popular sovereignty that could be aspired from the perspective of the public sphere and, consequently, on the controversy involving the need to complement discursive arenas by means of effective spheres for popular deliberation1. The internal debate expresses the vitality of this approach and the significant number of scholars and political activists that adhere to it (DAGNINO, 2002; EVANS, 2003; FEDOZZI, 1997; FUNG; WRIGHT, 2001; GOHN, 2001; GUGLIANO, 2008; JACOBI, 2002; NAVARRO; GODINHO, 2002; AVRITZER, 2000)2 These authors can be grouped since they share the view that, existing together with the traditional mechanisms for political participation of representative democracies, such forums can bring about extensive deliberation and constitute new ways of collective exercise of political power. Yet, they consider that such forums could be indicating the constitution of a new kind of democracy in comparison to the traditional forms of representative democracy. Considering a wide universe of authors, the studies of Avritzer (2000) and Santos (1999) stand out among those which more consistently examined the potentialities of participatory bodies, particularly, participatory budgeting experiences. While Avritzer claims that self-organization of civil society and participatory forums can interconnect to constitute a radical variant of deliberative democracy, Santos calls the attention to the possibilities of reinventing democracy through a project in which both the State and the civil society would renew their social roles. Although not all authors fully adopt a theoretical framework inspired in the work of Habermas and centered in the characterization of deliberative democracy, it is possible to identify the influence of this approach in some of the seminal works of the group (AVRITZER, 1997; COSTA, 1997, 1999). From this perspective, the social movements that entered Latin American political arenas and participatory forums comprised groups for thematization of general concerns in the ambit of the public sphere, therefore contrasting with corporate groups - labor unions, political parties - which advocated for particular interests (COSTA, 1994; COSTA, 1997). The participation of social movements in Latin American democratization processes have brought to the agenda a new form of relationship between State and society, a fact that entailed the introduction of experimentalism in the sphere of the State (GUGLIANO, 2008; SANTOS; AVRITZER, 2002). The belief in the inevitability of representation in complex societies with huge populations was under challenge in view of increasing diversity - ethnic, cultural and of concerns - involved in contemporary political arrangements. The articulation between representative and deliberative democracy could offer promising responses in defense of subaltern interests and identities and the success of participatory experiences would be related to the "capabilities of social actors to translate information and practices from the social level to the administrative level" (SANTOS; AVRITZER, 2002, p. 54). In turn, the approach that ascribes neo-corporatist features to participatory forums is inspired in a review of studies on this subject, especially on the formulations developed by Schmitter (1974). According to this author, the main characteristic of modern state corporatism is the association between interest groups and ruling sectors of the State. Corporatism would be a system in which the State allows the formation of a set of bodies representing social interests, which would count on the participation of particular organizations, either created or licensed by the State, and which would hold the monopoly of such representation. Within this arrangement, state officials would hold some control on the appointment of leaderships and selection of claims to be put on the discussion agendas of corporatist bodies. Concurrently, the leaderships would reinforce their authority within the organizations they represent as a result of the prestige acquired through the fulfillment of their demands. There was a trend, since the creation of the concept of state neo-corporatism, to direct such concept especially to the study of the State's guiding action in the relations between capital and labor, and also to consensual solutions of conflicts involving interests of the economic market and of state regulation (ALMEIDA, 1998; KELLER, 1998; OFFE, 1992). However, the neo-corporatist approach was gradually extended to the whole set of public policies, particularly in terms of an analytical alternative to pluralism3 (RIVERA, 1995; LIJPHART, 2000). The use of the concept of neo-corporatist groups or neo-corporatist forms of representing interests, combined to the use of Hirschmanian concepts of "voice" and "exit", offers elements for making generalizations on the institutional and political conditions that led to the constitution of the forums and that explain, at least partially, their working. The concept of "voice", arising from Hirschman's (1970) work, represents a relevant analytical tool for examining the relation between participation and public administration, to the extent that it establishes a connection between the freedom of members to influence the behavior of an organization - e.g., a government, an area of public policy - and the degree of efficiency in the operation of such organization. According to Hirschman, there would be three ways to solve processes that involve conflict of interest: the "exit", a typical market mechanism through which the citizen gives up either buying or using a good or service; or even withdraws from membership in an organization; the "voice", as a political mechanism that enables to protest, to oppose, to express preferences, to exert influence; and "loyalty", behavior adopted by those who are willing to hand over one's own preferences in favor of certain fidelity commitments. As a consequence, participatory forums could comprise neo-corporatist "intermediary organizations" in the sense attributed to the term by Streeck and Kenworthy (2003, p. 15-17), that is, institutions not only recognized as also, often, seed by the own governments, which exert strong influence over them aiming at intermediating interests between the various social actors. Nevertheless, participatory forums would ultimately remain free to deny cooperating with governments, although contributing to solve organizational problems. The interpretation of participatory forums as neo-corporatist units gathers a smaller number of authors (BOSCHI, 1999; SCHMIDT, 2001, SANTOS, 2001). In general, social scientists who emphasize the neo-corporatist element in participatory processes tend toward identifying such bodies as complementary forms of representative democracy, stressing their potential for improving both governance and accountability. These authors do not make the case for modes of participatory democracy as opposed to representative democracy. Moreover, many such studies show a trend to consider that the participant advocates private interests while resident of a particular region or beneficiarie of certain public policies. One of the pioneers in such analytical perspective was Boschi (1999), who claimed that councils of public policy and social rights often constitute neo-corporatist units in which different interests would be represented under the supervision of either public institutions or sound local associations. New forms of coordination between traditional decision making processes of public administration and the representation of social concerns could be settled in such forums. There would be a trend to set a balance between efforts towards autonomy by decision makers and towards approach and penetration by client groups. Such balance may help to understand the underlying conditions of policies formulation, and also to change paths of existing public policies. Schmidt (2001) also regards Brazilian participatory forums as having a neo-corporatist character, and underlies what he calls positive and negative consequences of such forums for the advancement of democratization. According to this author, participatory mechanisms mean a way for delegation of State responsibilities to social organizations that implies a shared responsibility for the process. Santos (2001), in turn, calls our attention to the assumption that, in Brazil, although the bureaucratic decision making arena has not experienced changes during the democratic period, strategic actors who were previously excluded would have been integrated through participatory forums of social and environmental areas (Santos, 2001). For this author, as from the administrations of Fernando Henrique Cardoso (1995-2002), a twofold pattern of relationship with social actors was established, with the decisions regarding economic policy being made in a context of bureaucratic isolation. And, in the ambit of social and environmental policies, "decision making structures comprising the institutionalized participation of groups affected by such policies" were built (SANTOS, 2001, p. 746). She claims that, in contexts of developing countries, with markedly unequal socioeconomic structures, forms for interest representation such as the neo-corporatist could open decision making opportunities for the social groups without the means to get appropriate representation in the pluralist sphere (Santos, 2001, p.756). In this section, we could note that studies that regard Brazilian participatory forums as mechanisms which promote democratization of public administration can be classified in two groups. Despite some divergences, both consider that the institutional design of these forums favors the emergence of a new kind of decision making process which may either encompass common interests, as in the view of supporters of deliberative-democratic theories, or include new groups of sectional interests, according to backers of the neo-corporatist theses. However, we must yet examine the institutional characteristics of both kinds of forums in order to identify what interests could be represented in them. Furthermore, it is necessary to verify whether they play a relevant role in the broad process of political decision making by governments or whether they make decisions solely on secondary matters of the agendas; i.e., if the decisions deal with macro-political dynamics or rather handle sectoral concerns. These two kinds of forums above indicated present similar backgrounds: the participatory experiences of the 1970s and 1980s (CASTRO, 1988; COSTA, 1997; FERREIRA, 1991; SOUZA, 2001, p. 161-163). Municipal governments in the states of São Paulo, Santa Catarina, Minas Gerais and Rio Grande do Sul created councils and community centers, and developed ways for public consultation in the areas of health services, urban development, environmental policies and in budgeting processes5. Participatory budgeting became well known especially because of the experiences in the cities of Porto Alegre and Belo Horizonte which started respectively in 1989 and in 1993. Both experiences began with the election of the Workers Party (PT - Partido dos Trabalhadores) candidate and remain working until the present, even after the defeat, in 2004, in Porto Alegre, of the left coalition responsible for establishing the participatory budgeting. Yet, besides these two cities, participatory tests have been attempted for debates on public budgeting in cities like Lages, SC(1976- 1981); Vila Velha, GO (1983- 1986); and in Pelotas, RS (1984-1985), to mention only a few examples (Gugliano et al., 2008). Since 1990, participatory budgeting experiences have spread all over the country. Instituto PÓLIS considers that, between 1989 and 2004, at least 261 cities of 23 Brazilian states have created processes involving people's participation in decisions on budget allocation (POLIS, 2006). In 2005, 16 out of 31 cities of the metropolitan region of Porto Alegre counted on participatory mechanisms involving municipal public budgeting (Côrtes, 2005). In 2007, the Brazilian Network of Participatory Budgeting was created, gathering 42 municipalities (RBOP, 2010). There are also some experiences of participatory budgeting at state level as in Rio Grande do Sul, Pernambuco, Acre and Pará (Côrtes, 2003; Lubambo; Coelho, 2005; Governo do Estado do Pará, 2010). Each of these has its own characteristics. There are huge differences regarding scope, size of population and territorial range, as also great discrepancies in terms of political culture and politico-institutional traditions within each locality involved. Nevertheless, it is possible to identify some elements in their institutional designs that are recurrent enough as to be considered participatory budgeting. The first of such elements regards to the responsibility for the creation of participatory budgeting forums. The Brazilian Constitution establishes that the elaboration of budget proposals is exclusively incumbent upon the Executive Branch (Brasil, 1988, art. 165). Therefore, all participatory budgeting processes must be an initiative of governmental authorities. It implies a strong influence of government's officials upon the whole process, since the lack of a national regulation - something similar to the constitutional principles that guide the dissemination of public policy councils - makes the existence of the process in itself dependent on the Executive Branch. Other three features shared by those experiences refer to: a) the kind of participants involved; b) the most frequent issues that comprise the discussion agendas; and c) the most recurrent and general aspects of their workings and dynamics. Potential participants are all voting-age citizens of the city or the state6, though, according to Dias (2002) and Silva (2001), most of those engaged come from the poorer neighborhoods of the cities. The decisions deal mostly with allocation of capital expenditure and, sometimes, of current expenditure. Yet, the proportion of budget resources under discussion may be quite different in each case (MARQUETTI, 2008). The participatory budgeting dynamics of working is directly dependent upon the political will of government officials. Nevertheless, in practice, this definition is the outcome of an agreement involving the initial proposal of government officials and those of the representatives of civil society. 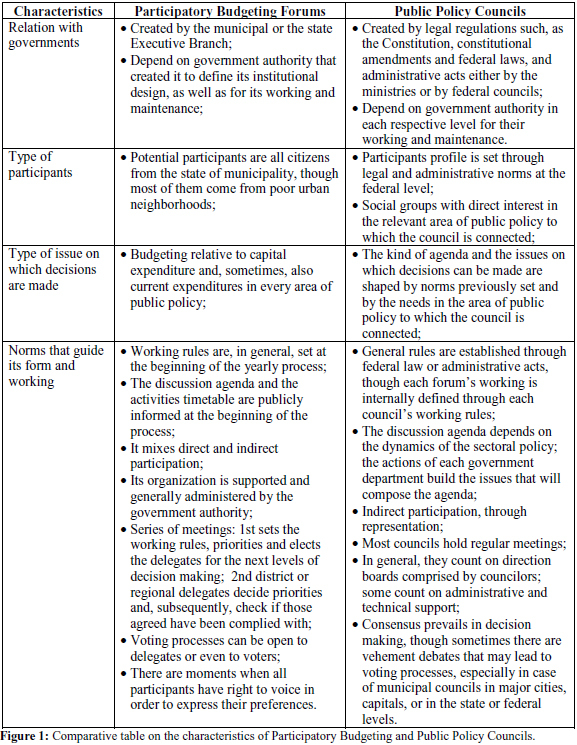 Once established the forums of participatory budgeting, their working rules allow participants themselves to redefine the norms that guide their work. When a consensus is reached, the discussion agenda and the activities timetable become public information. Thus, both potential participants and those who effectively take part in the budgeting activities may plan their participation and follow resulting decisions. The forums may combine mechanisms for direct and indirect participation. Direct participation occurs, primarily, at the levels of either neighborhoods or thematic issues in the case of municipal processes; or at the levels of districts and cities in case of state participatory budgeting. As to the indirect participation, it refers particularly to the election of delegates and representatives in broader forums for coordination of the participatory processes at distinct levels. In Porto Alegre, for instance, direct participation occurs during regional and thematic general meetings, and indirect participation is observed in forums of delegates and in the council of participatory budgeting. In a similar way, state participatory processes can also combine direct spheres of participation, e.g. the general meetings in cities or districts, with indirect forms. Such blending of participatory practices has been applied in several instances such as in participatory budgeting in Rio Grande do Sul (1999-2002). Budget is discussed at public meetings, at district level when dealing with municipal processes, or in the ambit of cities for state processes. These meetings generally gather activists from social movements, residents from distinct regions of the city, government representatives and politicians. They seek to establish priorities and elect delegates who will take part in the higher levels of decision making. Delegates from all districts and regions deal on priorities and later check if the priorities agreed are being carried out. Very often such delegates attend to specific forums where the policies debated at the general meetings are improved, and are also responsible for the election of representatives for the process main coordinating body - the Participatory Budgeting Council. Although being in place some election processes open either to delegates or even to all voting citizens in the relevant region (potential participants), a distinctive characteristic of participatory budgeting in comparison to other modes of participation in public budgeting is the right to voice. Participants may express their preferences during the meetings that are planned to set expenditure priorities. Therefore, considering the relations established between participatory budgeting experiences, it is possible to claim that they comprise arenas where issues of public interest are discussed. Thus, it appears appropriate, the perspective that describes these forums as bodies which comprise the public sphere and through which common interests are thematized by social actors who translate practices and information from the social context to the political-administrative level. In most of the cases, participatory budgeting is open to all citizens, although the regular participants are generally activists of urban social movements. According to this same perspective, in view of their peculiar organizational patterns and their embeddedness in the social fabric, social movements are able to supersede the traditional corporatist model in which interest groups bring private demands to the public arenas. On the grounds of constitutional precepts, the creation of participatory budgeting forums relies on the political will of the Executive Branch. Thus these forums' working rules result, generally, from a governmental decision. In such case, are the decision makers themselves who establish that citizens must participate in the design of budget proposal and who define the institutional structure of the participatory process to be implemented. However, the scope of control by government officials is limited by the public character of the budgeting discussion arenas and by the role attributed to government representatives in the working rules defined by consensus. In Porto Alegre, in addition to this context there was a view that an autonomous institution of civil society was emerging and that, therefore, its working rules should only be set through its internal channels of deliberation. The paradigm established in Porto Alegre has been followed in other municipal participatory processes, in which working rules are voted on a yearly basis at the participatory budgeting council, or at general meetings. In this way, once the working rules are the outcome of a consensus, it is indeed possible for social actors to transfer practices and information from the social sphere to the political-administrative one. Although decisions made refer only to a limited share of the budget, they impact every area in the public administration by promoting consensus through processes in which the interest groups must consider the demands of other participants. However, given their poorly institutionalized character in comparison to public policy councils, these forums become more vulnerable to political changes in the Executive Branch and, thus, are less liable to become a generalized mechanism for public administration in the country. Paradoxically, the same institutional freedom - in the sense that it allows to set its own working rules - that offers to decision makers a unique opportunity to make experiments within the governmental sphere (SANTOS; AVRITZER, 2002, p.54), ends up by being the Achilles' heel when it is necessary to guarantee the continuity of participatory processes in the face of change of ruling party in the relevant governmental sphere. The other variety of forum examined here - the public policy councils - has its roots in the areas of education and social security. The first municipal councils of education were established in the 19th century (WERLE, 1998). In the area of social security there were representatives of workers from administrative associated bodies such as the Retirement and Pensions Saving Funds and Institutes, created in the 1920 and 1930 decades (MALLOY, 1977). In the Brazilian case, the health councils, created in 1990 by Law no. 8142/90 (BRASIL, 1990), became the paradigm which inspired the creation of councils in other areas of public policies. This legislation established that health councils should be constituted at the federal, state and municipal levels of government. Their fast dissemination is related to the process of decentralization of health care promoted by the federal government. The positive inducement to the creation of these forums rested on the requisite of their existence, among other conditions, for federal financial resources to be transferred to sub-national levels of public administration (CÔRTES, 1995). In 2001, 98% of Brazilian municipalities - i.e., 5,426 out of 5,506 cities - and, from 2005 on, all cities in the country, counted on a health council (MINISTÉRIO DE SAÚDE, 2006). Although not so disseminated as the health councils, by the end of the last century and the beginning of the 2000s, public policy councils were created in almost every area (BULHÕES, 2002; CARVALHO, 1998; CORTES, 1995; DAGNINO, 2002; RAICHELES, 2000; SANTOS JUNIOR, 2001; TATAGIBA, 2002). There are councils in the areas of income and employment, social security, rural development, social protection, education, environment, urban planning, public security, drug control among others. There are councils which deal with the guarantee of the rights of children, of black people, of indigenous people, of women, of handicap people, aged people etc. Differences between these councils are more prominent than those between the several forms of participatory budgeting. Divergences are mainly associated to the institutional framework of each public policy area; to political culture and traditions of each region or city; to the positions of municipal and state government officials; and to the existence, in each area of public policy, of a policy community concerned with strengthening alliances or coalition which may influence decision making in governmental policy. In despite of this, the institutional design of these forums shows a common base. During the last decade, processes for decentralization of financial resources and responsibilities from the federal government level to sub-national ones were in place for most areas of social policies. This was the case in the areas of health care, social protection, income and employment support, elementary education and rural development among others. A set of legal rules - such as the Constitution of 1988, constitutional amendments and federal laws - and administrative acts - both by the ministries and by the councils themselves - created participatory forums and defined who should participate in them. The new Constitution, for instance, established the "participation of the population" in the area of social protection and "of community" in the health care system (BRASIL, 1988, art. 204/II; art. 198/III). The laws that regulate the organization of the health care and social protection systems (BRASIL, 1993, Lei 8.742; BRASIL, 1990, Lei 8.142) established that the councils should be created at the federal, state and municipal levels of public administration. The participants of these councils have also been defined either by law or by administrative acts. In the health care area, half of the councils' members is comprised by representatives of users of the health care services, the other half is comprised by representatives of governmental bodies, health professional associations and services provider institutions (BRASIL, 1990, Lei 8.142). As to the area of social protection, half of the counselors is formed by governmental representatives and the other half by members of civil society organizations representing beneficiaries of social services, professionals of the relevant area and services provider institutions (BRASIL, 1993, Lei 8.742). In the area of employment and labor, the councils have a tripartite structure, being composed by representatives of government, employers and employees (CODEFAT, 1995, Act nº 80). So, these forums are constituted by representatives of government and of civil society and the participant social groups have direct concern in the particular area of public policy. As we may see, several characteristics of these forums contrast with those of participatory budgeting. These latter are open to all citizens and even their regular participants, social movements activists, may have interest in distinct areas of public policy, whereas the councils gather participants specialized in particular areas. Another remarkable difference is that the councils are highly institutionalized while participatory budgeting forums are not. The councils make part of the administrative structure of the public policy departments to which they are linked. Such high level of institutionalization is expressed in the variances in the content of agendas and in the distinct forms of decision that councils can make in each area of public policy. For example, while in the area of labor and employment they make decisions on the kinds of courses for professional qualification that will be funded with public resources, in the area of social protection they define which private service provider institutions will be apt, in compliance with legal criteria, to receive public resources. The councils' agendas, that is, the matters on which they hold power to make decisions, and their institutional role are shaped by previously set norms and by the needs resulting from the institutional characteristics of each area. The general working dynamics of the councils are also set by either legal or administrative rules. Even if their specification is defined by consensus or, as in many cases, is imposed by government officials, the general structure - in what respects, for instance, to the sort of participants or the attributions of the forum in the area - is not open to debate. Furthermore, by contrast with the working dynamics of participatory budgeting, whose matters for decision making are defined at the beginning of the yearly process, for the councils, the agenda is permanently open to new policies, programs or actions proposed by the government authorities. Unlike the participatory budgeting forums, which combine mechanisms of direct and representative democracy, councils are comprised exclusively by representatives. Direct participation is only possible in some cities where district councils were created, although these latter hold no institutional attribution as defined by the national legal and administrative regulation. Participants of the councils at the federal, state and municipal levels are either elected or indicated by organizations or population sector they represent; or, also, appointed by government authorities in cities where political elites hold the control over virtually all aspects of the municipal political dynamics. Most councils use to hold regular meetings, although some studies have shown that, in several cases, they do not hold public meetings (CORTES, 2005; IBGE, 2004). This happens when municipal authorities formally institute the councils with the sole purpose of complying with the law for obtaining federal financial resources. The council has generally a board of directors, usually elected by members according to its working rules. Even when governmental authorities do not administer the forum, they have a strong influence over the elaboration of its agendas. On the other hand, government authorities can either make available or withdraw the infrastructure that enables the good workings of the councils. Some of these forums count on technical and administrative support of municipal, state and federal authorities. Health municipal councils, for instance, usually receive this kind of support, unlike the councils of elementary education which do not (CÔRTES, 2005). As to decision making process, even though decisions are frequently carried out by consensus, in many cases the discussions lead to voting processes. This is observed particularly in larger cities, especially capitals, and in state and federal councils as well. Hence, in spite of existing differences in the workings of councils from distinct areas of public policies, and even within a same area, particularly at municipal level, some common characteristics allow for their analysis. Thus, the interpretations that describe the Brazilian participatory experiences as neo-corporatist units through which distinct interests are represented can be said to be the most appropriate for understanding the institutional role of the public policy councils. Within these institutional spheres, concerns that previously had no chance to be expressed are posited before public authorities who must - somehow - to find responses to new forms of social demands. These are forums highly institutionalized, organized and regulated by both legal and administrative rules set in each area of public policy, and their participants represent groups that advocate particular interests in these areas. The table below is a summary of the analysis carried out in this section. The present article examined two currents of interpretation of the institutional role of participatory forums, which consider such experiences as advancements in the forms of governance and public administration. It sought furthermore to verify the appropriateness of such currents to the analysis of the participatory mechanisms most disseminated in Brazil, namely: participatory budgeting and public policy councils. Some of those studies argue that the Brazilian participatory experiences comprise public arenas in which common interests are expressed, brought forth by social movements. Another current of interpretation considers that these forums are neo-corporatist mechanisms representing particular concerns that had never before been publicly claimed in the presence of the governments. Through the analysis of both forms of participatory forums, we suggested that the first current of studies is best suitable for understanding participatory budgeting forums and the second one, for the public policy councils. This can be explained by the specific characteristics of each mechanism. With regard to participatory budgeting, it is noticeable the constitution of a public sphere with relatively small limits to access and in which citizens may discuss and deliberate about problems in the community with some autonomy in relation to governments. Deliberations produced in this way are referred to the State with expectations that they get to be implemented within a reasonable timeframe. It is known that, in practice, the dynamics of participatory budgeting is not so virtuous, since governmental participation does not take place symmetrically in relation to the position of civil society representatives, but from a hierarchically higher stance, based on a differentiated access to power resources. However, this fact does not change its character of a deliberative institution with relative autonomy with regard to governments, a sphere for incorporation of demands and proposals by distinct actors from civil society, who transfer practices and information from the social sphere to that governmental. Surprisingly, the relative autonomy in the constitution of institutional designs and working rules - which allows ways of action and information to be passed from civil society to governments - depends almost exclusively on a government initiative. This occurs because there is no legal framework to base the existence of participatory budgeting, since the elaboration of budget proposals is constitutionally defined as a prerogative of the Executive Branch. Even so, the lack of legal regulation does not prevent the establishment of de facto rules, which can institutionalize the forum, since the political environment allows that. This seems to be the case of Porto Alegre, where governments from distinct political parties have maintained Participatory Budgeting working. As to the public policy councils, the opposite is observed: the general features that describe their institutional roles in the various areas of public policy, the participants to be admitted and, especially, the very existence of these forums, are defined by law. The access to them is not granted to all citizens. Only representatives of the organizations appointed, generally, by law, or by administrative act of the municipal or state Executive Branch, may be considered as full members, with right to voice and vote. The discussions agenda is sectoral, and generally undergoes strong influence by the working dynamics of the area of public policy to which the council is connected. Nevertheless, these forums allow demands from public policies beneficiaries to interact with the State, thus opposing the trend towards autonomy by government authorities. Thus, they represent a novelty in the form as decisions about such policies are made in Brazil. As their institutional designs are defined through the legal and administrative frameworks of the various areas of public policies, the chance for the organization of working dynamics to be modified by participants themselves is lesser. Consequently, even if their autonomy in relation to governments is small, it is greater than that that prevails in the participatory budgeting. The reason is that the legal and administrative regulations, which support their existence and shape their forms of working, entail high political costs for those who do not comply with them - lawsuit by the Attorney General Office, loss of federal financial resources, etc. Undoubtedly the institutionalization of the council puts limits for bringing practices and information from civil society inside of it, by establishing that participants from society shall represent interest groups from each area of public policy. This is an aspect that works more fluently in the case of participatory budgeting. Nevertheless, it is precisely this characteristic that prevents the governments to dissolve the councils and that helps to explain why, currently, these bodies are disseminated throughout all municipalities in the country, while the participatory budgeting exist only in some hundreds of cities. Finally, we want to emphasize that much research work still has to be done on the Brazilian participatory budgeting forums and their distinct analytical paradigms. With the present paper, we intended to foster controversy on these matters, in view of the need for strengthening the debate on new experiences for citizens' inclusion in public administration. ALMEIDA, Maria Herminia Tavares. Sindicatos em tempo de reformas.São Paulo em Perspectiva, v. 12, n. 1, 1998, p. 3-9. AVRITZER, L. Um desenho institucional para o novo associativismo, Lua Nova, n. 39, 1997, p. 149-151. ______. Teoria democrática e deliberação pública. Lua Nova, n. 50, 2000, p. 25-46. AZEVEDO, Sérgio; ABRANCHES, M. Conselhos Setoriais o caso da Região Metropolitana de Belo Horizonte. Cadernos Metrópole, n. 7, 2002, p. 41-71. BAKER, Gideon. Civil society and republican democracy. Paper for Political Studies Association-UK Annual Conference, 10-13 April, London, 2000. BONFIM, Washington L.S. ; FERNANDES, A.S.A. ; Teorias Democráticas Contemporâneas e o caso Brasileiro Pós-Constituição de 1988. Paper presented at XXVIII Encontro Anual da ANPOCS. ST23. Caxambu, 2004. BOSCHI, Renato Raul. Decentralization, clientelism, and social capital in urban governing: comparing Belo Horizonte and Salvador. Dados. [on line], v. 42, n. 4, 1999, p. 655-690. Available at: <http://www.scielo.br/scielo.php?script=sci_arttext&pid=S0011-52581999000400002&lng=en& nrm=iso>. ISSN 0011-5258. BRASIL. Assembléia Nacional Constituinte, Constituição da República Federativa do Brasil de 05 de Outubro de 1988. BRASIL. Congresso Nacional, Lei 8.142 de 28 de Dezembro de 1990 - On the participation of the community in the administration of the Unified Health System (SUS - Sistema Único de Saúde) and on intergovernmental transfers of financial resources in the area of health, 1990. BRASIL. Congresso Nacional, Lei 8.742 de 7 de Dezembro de 1993 - On the organization of the social protection, 1993. BULHÕES, M.G.P. Plano Nacional de Qualificação do Trabalhador no Rio Grande do Sul/Brasil: avanços e limites na participação de atores governamentais e não governamentais. In: MILANI, C.; ARTURI, C.; SOLINÍS, G. (Eds.). Democracia e governança mundial: que regulações para o século XXI? Porto Alegre: UFRGS/UNESCO, 2002, p. 137-165. CARVALHO, A.I. Conselhos de saúde, participação social e reforma do Estado. Ciência & Saúde Coletiva, v. 3, n. 1, 1998, p. 23-25. CASTRO, M. Helena G. de. Equipamentos sociais e política local no pós-64: dois estudos de caso. Espaço e Debates, n. 24, 1988, p. 67-74. CODEFAT. Resolução nº 80, de 19 de abril de 1995. Altera a Resolução nº 63, de 28 de julho de 1994, sets criteria for the recognition, by CODEFAT, of employment commisions constituted at the municipal, state and federal levels, in the ambit of the public system of employmenT, 1995. CORTES, Soraya M. V. Fóruns participatórios na área de saúde: Teorias do estado, participantes e modalidades de participação. Revista Saúde em Debate, n. 49-50, 1995, p. 73-79. CORTES, Soraya M. V. Arcabouço histórico-institucional e a conformação de conselhos municipais de políticas públicas. Educar em Revista, n. 25, 2005, p. 143-174. CORTES, Soraya M. V. Fóruns participativos e governança: uma sistematização das contribuições da literatura In: LUBAMBO, Catia; Coelho, Denilson B.; Melo, Marcus A. (Orgs. ), Desenho Institucional e Participação Política: experiência no Brasil contemporâneo. Petrópolis: Vozes, v. 1, 2005, p. 13-32. CORTES, Soraya M. V. Orçamento Participativo e Conselhos Municipais de Políticas Públicas e de Direitos na Região Metropolitana de Porto Alegre (RMPA). Relatório de Pesquisa, Porto Alegre, 2005. COSTA, Sergio. La esfera pública y su mediaciones entre cultura y política: el caso de Brasil. Metapolítica, n. 9, 1999, p. 95-107. COSTA, Sergio. Movimentos sociais, democratização e a construção de esferas públicas locais. Revista Brasileira de Ciências Sociais [online]. Fev. 1997, v. 12, n. 35. [online]. Fev. 1997, v.12, n. 35. Available at: <http://www.scielo.br/scielo.php?script=sciarttext&pid=S0102-69091997000300008&lng=en&nrm=iso>. ISSN 0102-6909. DAGNINO, E. Sociedade civil e espaços públicos no Brasil. In: DAGNINO, E. (Ed.). Sociedade civil e espaços públicos no Brasil. São Paulo: Paz e Terra. 2002, p. 9-15. DIAS, Marcia R. Entre a representação e a participação política: o debate acerca da institucionalização do orçamento participativo em Porto Alegre. In: MILANI, C.; ARTURI, C.; SOLINÍS, G. (Eds.). Democracia e governança mundial: que regulações para o século XXI?. Porto Alegre, UFRGS/UNESCO, 2002, p. 204-230. EVANS, Peter. Além da Monocultura Institucional': instituições, capacidades e o desenvolvimento deliberativo. Sociologias, jan./jun., n. 9, p. 20-63, 2003. FARIA, Claudia Feres. Democracia deliberativa: Habermas, Cohen e Bohman. Lua Nova, n. 50, 2000, p. 25-46. FARIA, Carlos Pimenta. Idéias, conhecimento e políticas públicas: um inventário sucinto das principais vertentes analíticas recentes. Revista Brasileira de Ciências Sociais, v. 18, n. 51, 2003, p. 21-29. FEDOZZI, Luciano. Orçamento Participativo - Reflexões sobre a experiência de Porto Alegre. Porto Alegre: Tomo Editorial, 1997. FERREIRA, Ana Luiza S. S. Lages: um jeito de governar. São Paulo: Instituto Polis, 1991. FIORINA, Morris P. A dark side of civic engagement. In: SKOCPOL, Theda; FIORINA, Morris P. (Eds.). Civic engagement in American democracy. Washington: Brookings/Sage, 1999, p. 395-425. FUNG, Archon; WRIGHT, Erik O. Deepening democracy: innovations in empowered participatory governance. Politics & Society, March, v. 29, n. 1, 2001, p. 5-41. GOHN, Maria da G. Conselhos gestores e participação política. São Paulo: Cortez, 2001. GUGLIANO, Alfredo Alejandro. Mirando hacia el sur. Trayectorias de las democracias participativas em América Latina. Sistema, n. 203-204, mayo, 2008 p. 149-170. GUGLIANO, Alfredo Alejandro; LOECK, Robson; ORSATO, Andréia; PEREIRA, André Luis. Processos Participativos e Estratégias de Redistribuição: resgatando o Orçamento Participativo em Pelotas (1984-1985). In: MARQUETTI, Adalmir; PIRES, Roberto; CAMPOS, Geraldo Adriano G. de. (Orgs.). Democracia Participativa e Redistribuição. Análise de experiências de orçamento participativo. São Paulo: Xamã, 2008. HABERMAS, Jürgen. Direito e Democracia: entre facticidade e validade. v. 2. Rio de Janeiro: Tempo Brasileiro, 1997. HABERMAS, Jürgen. Três modelos normativos de democracia. Lua Nova, n. 36, 1995, p. 39-54. IBGE. Perfil dos municípios brasileiros - Gestão pública 2001. IBGE. [on line]. Available at: <http://www.ibge.gov.br/home/estatistica/economia/perfilmunic/2001/default.shtm>. KELLER, Wilma. Neo-corporativismo e trabalho: a experiência brasileira recente. São Paulo em Perspectiva, v. 9, n. 4, 1998, p. 73-83. LAVALLE, Adrián G. Sem pena nem glória: o debate sobre a sociedade civil nos anos 1990. Novos Estudos Cebrap, n. 66, 2003, p. 91-109. LIPJHART, Arend. Modelos de democracia, formas de gobierno y resultados em 36 países. Barcelona: Ariel, 2000. LUBAMBO, Cátia; COELHO, Denilson B. Governo e sociedade civil aprendem: o que revela a experiência recente de Participação em Pernambuco? In: LUBAMBO, Cátia; COELHO, Denilson B.; MELO, M. (Eds.). Desenho Institucional e Participação Política. Experiências do Brasil contemporâneo. São Paulo: Vozes, 2005. MARQUETTI, Adalmir Antonio. Experiências de Orçamento Participativo no Brasil: uma proposta de classificação. In: DAGNINO, Evelina; TATAGIBA, Luciana. (Orgs.). Democracia, Sociedade Civil e Participação. Chapecó: Argos Editora Universitária, 2007. MALLOY, James M. Social security policy and working class in twentieth-century Brazil. Journal of Interamerican Studies and World Affairs, n. 19, v. 1, 1977, p. 35-59. MULLER, Pierre; SUREL, Yves. L'analyse des politiques publiques. Paris: Montchrestien, 2002. NAVARRO, Renato G.; GODINHO, Maria Helena L. Movimentos sociais (populares), conselhos municipal e órgão gestor. Cadernos Metrópole. n. 7, 2002, p. 73-92. OFFE, Claus. Partidos políticos y nuevos movimientos sociales. Madri: Sistema, 1992. PINTO, Celi R. J. Espaços deliberativos e a questão da representação. Revista Brasileira de Ciências Sociais, v. 19, n. 54, 2004, p. 97-113. PÓLIS. Levantamento das Cidades Brasileiras que Realizaram o Orçamento Participativo (1989 - 2004). Pólis [on line]. Available at: <http://www.polis.org.br/download/239.pdf>. 2006. PORTA, Donatella della. Deliberation in Movement: Why and How to Study Deliberative Democracy and Social Movements. Acta Politica, n. 40, 2005, p. 336-350. PRZEWORSKI, Adam. Democracia y Representación. Revista del CLAD, n. 10, feb., 1998, p. 9-44. GOVERNO DO ESTADO DO PARÁ. Available at: <http://www.pa.gov.br/noticia_interna.asp?id_ver=4811>. 2010. RAICHELES, R. Esfera pública e conselhos de assistência social. Caminhos da construção democrática. São Paulo: Cortez, 2000. REDE BRASILEIRA DE ORÇAMENTO PARTICIPATIVO. Available at: <http://www.pbh.gov.br/redebrasileiraop/html/historico.htm>. 2010. SANTOS Jr, O.A. Democracia e governo local. Rio de Janeiro: Revan/FASE, 2001. SANTOS, Boaventura de S.; AVRITZER, L. Introdução: para ampliar o cânone democrático. In: SANTOS, B. S. (Ed.). Democratizar a democracia. Os caminhos da democracia participativa. Rio de Janeiro, Civilização Brasileira. 2002, p. 39-82. SANTOS, Boaventura de Sousa. Reinventar a democracia: entre o pré-contratualismo e o pós-contratualismo. In: OLIVEIRA, Francisco; PAOLI, Maria Célia. (Orgs.) Os sentidos da democracia. Petrópolis, Vozes, 1999. SANTOS, Maria Helena de Castro. Which Democracy? : A Conceptual View from the Developing Countries Perspectives. Dados. [on line], v. 44, n. 4, 2001, p. 729-771. Available at: <http://www.scielo.br/scielo.php?script=sci_arttext&pid=S0011-52582001000400003&lng=en&nrm=iso>. ISSN 0011-5258. SCHMITTER, Philippe C. Still the Century of Corporatism? Review of Politics, v. 36, n. 1, 1974, p. 85-131. SCHMIDT, Benício Viero. O Estado, a nova esquerda e o neo-corporativismo. Cadernos CRH, n. 35, jul./dez., 2001, p. 85-105. SCHNEIDER, Aaron; GOLDFRANK, B. Budget and ballots in Brazil: participatory budgeting from the city to the state. IDS, Working Paper n. 149, Brighton, Institute of Development Studies, 2002. SOLE, Carlota. El debate corporativismo-neo-corporativismo. Revista Española de Investigaciones Sociológicas, v. 26, n. 84, 1984, p. 9-27. SOUZA, Celina. Políticas Públicas: uma revisão de literatura. Sociologias, v. 8, n. 16, jul./dez., 2006, p. 20-45. SILVA, Marcelo K. Construção da "participação popular". Análise comparativa de processos de participação social na discussão pública do orçamento em municípios da Região Metropolitana de Porto Alegre/RS. Tese doutorado, Universidade Federal do Rio Grande do Sul, 2001. SKOCPOL, Theda. Advocates without members: The recent transformation of American civic life. In: SKOCPOL, Theda; FIORINA, Morris P. (Eds.). Civic engagement in American democracy. Washington, Brookings/Sage, 1999, p. 461-509. SOUZA, Celina. Participatory budgeting in Brazilian cities: limits and possibilities in building democratic institutions. Environment & Urbanization, v. 13, n. 1, 2001, p. 159-184. TATAGIBA, L. Os conselhos gestores e a democratização das políticas públicas no Brasil. In: DAGNINO, E. (Ed.). Sociedade civil e espaços públicos no Brasil. São Paulo: Paz e Terra, 2002, p. 47-103. WERLE, Flávia. O.C. Conselhos Municipais de educação: estudo genético histórico. Cadernos de Pesquisa, n. 103, 1998, p. 123-135. 1 An interesting analysis on some of the main perspectives on the concept of deliberative democracy is developed by Faria (2000). 2 Although this research line has been quite influent during the 1980s in Brazil, several critical analyses have emphasized the limits of their theoretical-conceptual tools for analyzing the nature of the State and the civil society, as well as of participatory forums (BAKER, 2000; BONFIM; FERNANDES, 2004; LAVALLE, 2003; SILVA, 2004). 3 Pluralism is taken here as a theoretical current which emphasizes the autonomy of interest groups in the dynamics of definition of governmental public policies. 4 For more on this topic, see also the concept of "welfare corporatism" used by Mishra (1984) and Williamson (1989), in which the debate is focused on professionals and other producers of goods and services in the scope of the Welfare State. 5 Such experiences have been well documented by Instituto PÓLIS, which produced a significant corpus of researches that analyze various experiences of participation (SOUZA, 2001, p. 163). 6 Studies have shown a striking discrepancy between the cities and the states in what respects to capabilities for organizing the forums, level of political activism, educational attainment and gender of participants (SOUZA, 2001; WAMPLER, 2000; NAVARRO, 1997; SILVA, 2001).